This Friday morning we visited my favorite museum in the whole world: the Miniatur Wunderland in Hamburg. The museum holds the record of world’s largest model railway, awarded to it already before it added a second level of miniature worlds. 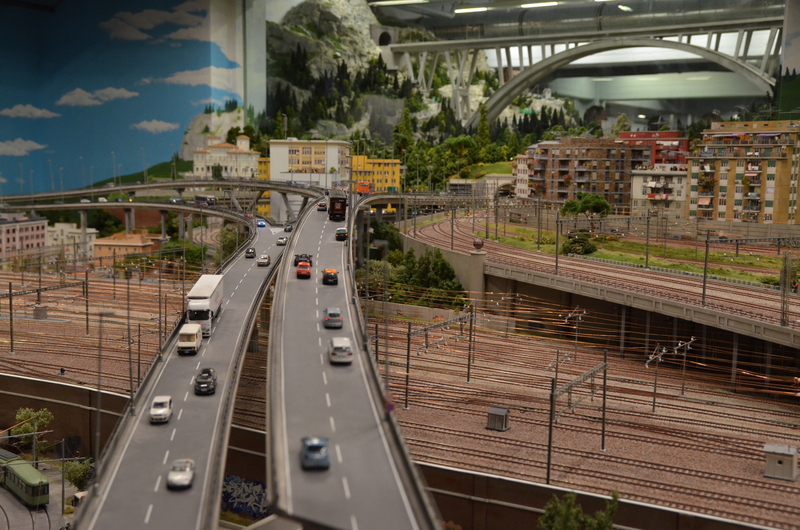 The numbers are truly mind-boggling: Miniatur Wunderland has 1040 trains, 4,110 buildings and bridges, 9,250 cars, and a whopping 260,000 figurines. To date, the creation of this wonderland has has cost 16 million euros and 760,000 working hours. But enough about numbers, let these pictures show you why we’ve already visited four (or five?) times over the years. The first time Birdy had been in the museum she was just 4 weeks old. She peacefully slept in the baby carrier and didn’t see a thing. We decided that opening of the Italy section exactly during hubby’s week of vacation is the perfect reason to visit again. At 2,5 years Birdy is big enough to be excited about trains, planes, and cars, she’s good on her feet and has enough endurance to see most of the museum. This time it was her brother who slept most of the time. We started our visit with the brand new Italy section and I have to admit, it’s definitely the most elaborate thing they have built so far! Then again, I have said that about every new addition to the Miniatur Wunderland. One of the things that make the miniature worlds particularly fun is the transition from day to night. After every 15 minutes of daytime, the sun sets and the trains, cars, and buildings light up. Currently Miniatur Wunderland has nine sections: in addition to the newest addition of Italy, there is Hamburg, Middle Germany, the imaginary German town of Knuffingen, Knuffingen airport, Austria, Switzerland, Scandinavia, and the USA. Each is made in incredible detail and is so fun to explore. It’s so easy to be carried away by the grand scenes and gorgeous landscapes but in Miniatur Wunderland it pays off to look closely. You will find little stories and funny moments hidden for those who take their time and pay attention to detail. Birdy’s favorite part of our visit were all the little buttons that could be pressed for something to happen in the exhibit. One turned on a little screen that put her image inside the living room of a multistory building. Another operated an underground car elevator loaded with cars from beloved movies. Yet another started the operations of a Swiss chocolate factory and resulted in a tasty piece of gold wrapped chocolate. And so we hunted one little button after the other, excited to see what each of them does. One of my favorite parts of Miniatur Wunderland is the fully functioning miniature Hamburg Airport. The planes land, are being taxied off to the gate, little cars take care of transporting luggage, and a while later the plane takes off to a new destination. If you’re lucky, you might even see a Shuttle landing or the arrival of Millennium Falcon. In the Scandinavia section you can also see gigantic model cruise ships sailing in real water. Ever since it first opened back in 2001 Miniatur Wunderland has been in a non-stop process of expansion. The construction sites and workshops are open for visitors, and the museum offers special behind the scenes tours as well. It’s fun to make a stop at the control center and have a glimpse of the technology behind the magic. I’m already excited about the future plans of Miniatur Wunderland: Venice with a real water lagoon (already in 2017! ), Monaco complete with a live F1 car race, followed by England & Scotland (read more). If Birdy has any say in it, we’ll be coming back again and again. Since it’s one of Hamburg’s most popular attractions I strongly advise to pre-book your tickets online. The systems lets you choose a date and a preferred one one hour window of arrival. Plan it at least 3-4 hours for the visit, probably more if you want to make a break in between and/or use the onsite restaurant. Use the lockers to store your jackets and bags, it can get crowded and warm so the less you have on you, the better. If you have a stroller with you DO NOT take it inside the museum. Leaving it in the cloak room costs just one euro and it will save you and others a lot of discomfort. If you have a baby, take a carrier. If you have an older child, let them walk and/or carry them. There are play areas on all levels, and the diaper changing station is well equipped with free wet wipes and diapers. Pack some drinks and small snacks for you and the kids, keeping hydrated is important and you will need that extra energy! It’s definitely worth going back every two years or so, not only because they add new stuff but also because they update the old worlds!